Many students struggle to find the main idea of a passage or story. Students tend to confuse the main idea with the summary, while others just can’t seem to grasp the concept. Here are a few tips, ideas, and activities to help you teach students how to identify the main idea and the supporting details of a passage, short story, or book. Teaching the main idea is a process that should take a few weeks. The starting point is easy. Start simple and start with non-fiction texts. In non-fiction books, the title will usually tell you exactly what the topic will be, which is the first step to figuring out the main idea. The Important Book, written by Margaret Wise Brown, is a great book to use as an introduction to finding the main idea. This simple book is based on everyday objects and requires students to think deeply about the importance of these objects. This book might seem small and basic for older students, but it is such a great book for introducing the main idea and supporting details. 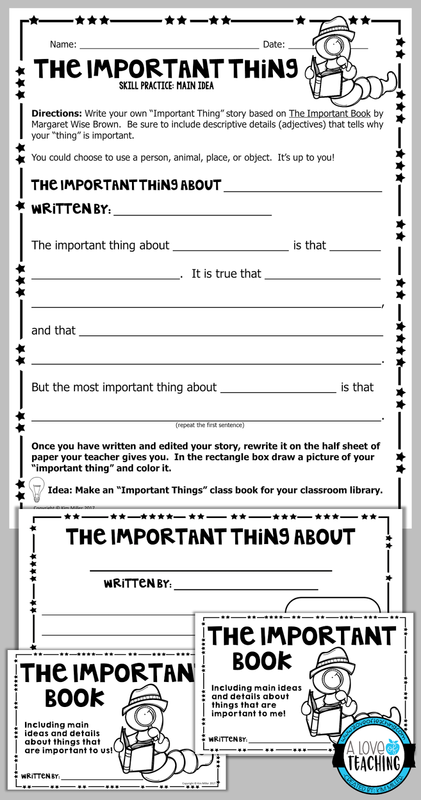 After reading and discussing the book with students, I use the template below to extend the lesson and get students thinking about the “important details” of objects, people, and animals. Click HERE to download this free activity to use in the classroom. ACTIVITY #2: IT’S IN THE BAG! A fun way for students to practice finding the main idea is to have them guess the main idea from a group of pictures or small objects pulled out a brown paper bag (The Mystery Bag). This activity requires some prep, but it’s worth it. Create a number of “themed” bags full of items that represent the supporting details to help students identify the main idea of each mystery bag. Create enough bags for stations around the classroom and include one extra bag for you to use as an example for the class. The objects could include small toys, pictures, household items, personal items… basically anything that will fit in the bag. *You could use actual items or pictures of items. Students are placed into groups and each given a bag of 3-4 items or pictures of items. The items/pictures represent the details that support the main idea. Each group examines the items in their mystery bag and identifies the topic (main idea). I like to have students list these on a separate sheet of paper. Once students have completed all the bags, I have them choose one bag to write a paragraph with using the main idea and supporting details from the bag. Students love this activity! Extend this lesson by having students create their own main idea mystery bags at home to share with the class. Click HERE to download a free sample of this activity. Once students have grasped the simple techniques above you will want to turn your focus to the topic sentence and supporting details found in a passage. You can tap into the kinesthetic learning style by using your hand for main idea activities. Give students a simple paragraph and a paper hand. Have students write the main idea of the paragraph in the palm of the hand and the topic sentence on the thumb. The rest of the fingers are for listing the supporting details. Instruct students to cut their hand out and fold the fingers over to make a fist. This shows that the main idea is what supports all of the details. You can also demonstrate this to students by using your own hand instead of the paper version. This is a unique and fun way for students to practice finding the main idea, topic sentence, and supporting details. This activity requires students to think differently and is a good way to assess students’ understanding of the main idea and supporting details while getting them to think “out of the box”. Choose a paragraph that has a very clear main idea with a few sentences that is somewhat on topic but doesn’t really support the main idea of the paragraph. Students must read the paragraph and determine which sentences DO NOT support the main idea. By doing this, students eliminate unneeded information and are only left with the main idea and supporting details. This technique is much different than what many main idea resources include. It really gets students to thinking more critically. First of all, there are tons of graphic organizers out there to supplement teaching main idea skills. However, no matter how cute or fun the graphic organizer may be, it is probably not going to help confused students understand the main idea any better. Typical main idea resources and graphic organizers go straight to having students come up with the main idea of a passage or story without any scaffolding. This makes it very hard for students in the early stages of learning this skill. Instead of expecting students to come up with the main idea themselves on a blank organizer, provide students with the main idea and supporting details. Have them place the statements in the correct locations on a graphic organizer. This will eliminate any frustration students feel when trying to come up with the main idea on their own. It also gives students practice in distinguishing between the main and the supporting details. This graphic organizer comes with a list of main ideas and supporting details that students can cut, sort, and glue in the correct locations on the chart. Remember, grasping these skills doesn’t happen overnight. The initial introduction and main idea lessons should span a few weeks, or possibly even a month. Once mastered, these skills need constant reinforcement and should be included in your reading curriculum throughout the year. Have students look for the “who” or “what” the story is about. Have them identify the most important thing about the “who” or “what” the story is about. THIS is the main idea. Once they find the main idea, make them prove it! Have students find 2-3 details that support the main idea. Hopefully, you can use some of these strategies in your classroom. If you chose to, I’d love to know how it goes. Leave a comment or share your success with me on social media! *The full version of each main idea activity found in this post is available as a bundle in my store at 20% off. Click HERE to learn more! Great post! I'm a kindergarten teacher and I find these are useful for my area too! Great ideas and resources! Thank you so much.